I must confess I've never heard of a Bakewell Tart and was slightly apprehensive about baking this concoction. But, like any good Daring Baker, I decided to rise to the challenge. The recipe is rather lengthy, so if you want it, just email me. Basically, there are 3 components to this tart. 1) Sweet Shortcrust Pastry 2) Frangipane (that's basically a combination of ground almonds, flour, butter, confectionery sugar and eggs 3) Jam (I used store-bought apricot jam). This was a pretty straightforward challenge. I really liked the result, but brought most of the tart to work because seriously, I do not need all those calories! And I wasn't sure if the dessert would freeze well. The only "issue" I experienced, was that when I took out the first slice of the tart, the jam sort of oozed out...maybe I did not let the tart cool enough? Here's a quick recap of what you do: make the crust. Let it sit in the refrigerator, then roll it out, put it into your tart pan and then into the freezer for 15 minutes. Meanwhile make Frangipane. Then add a layer of jam on top of the crust, then add a layer of Frangipane. Smooth everything out and bake it at 400 degrees for 30 minutes. Add sliced almonds and bake 5 more minutes. Voila. You are done! This is such a british pudding (or as i like to say: puddin :)). It comes in many forms here: tarts, cakes, slices, I've seen cupcakes, and I have even seen bakewell granola bars. Beautiful as always! Delicious filling too .. This looks delicious .. and the almond pattern is wonderful. :) What kind of jam did you use? I love the arrangement of the sliced almonds on top. Apricot and almond make a great combination, it sounds delicious! i love the thick frangipane! and i agree that the oozing jam made it look really scrumptuous!! awesome job! Despite of your jam problem, I do think that your Bakewell tarte looks amazingly beautiful!! Beautiful tart! What kind of jam did you use in your filling? The almonds on top are so pretty! Great job! Great minds think alike! I bought a big packet of almond slivers as I was going to decorate it exactly like that (I decided on something else last minute). It looks beautiful! You did a really great job with this challenge. 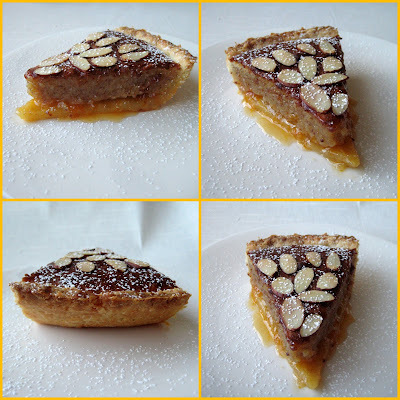 I love frangipane when it pair with a pureed fruit or sauce. Jam oozing out or not it sure looks delicious to me!! Yum!! I love the almond design =D. Your tart looks amazing, and the apricot jam sounds perfect!! Great job on your challenge. Your tart looks really delicious and love the way you had decorated it. Well done on the challenge Olga. That's a gorgeous tart & lovely pictures! Love the flaked almond & sugar topping! It's beautiful! this looks fabulous!! love the almonds on top. That is a beauty, as always! Your tart turned out beautifully! 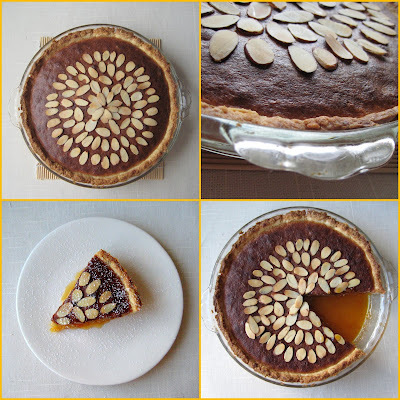 Beautiful tart and I love how you arranged the almonds on the top! Great job! What a beautiful tart! Greatly done! Beautiful tart!! I used to buy them in Tesco, but this one looks sooo much better... I would love to make it one day for kids.